I have long been a fan of Quentin Tarantino's movies, in fact, Kill Bill is one of my best movies of all time, so I know what to expect when I go to see one of them. I'm not a proponent for violence but I have to admit it feels good to see bad people killed. More than that, I love Tarantino's stories and the way he tells them - his characters, their dialogue, his camera work, the movie soundtrack, everything. Django Unchained delivered on all these points, in addition, it presented a mirror up to what is the real history of America for us to remember and bear in mind. So while most of his movies are personal, this is both personal and political. I was totally mesmerized by the almost 3 hrs film. Truth to tell though, I had to close my eyes at certain points in the movie because I couldn't bear to keep watching some of the deep pain and agony sprinkled through the story. This more than the violence was what I found disturbing, and several times I found myself crying. 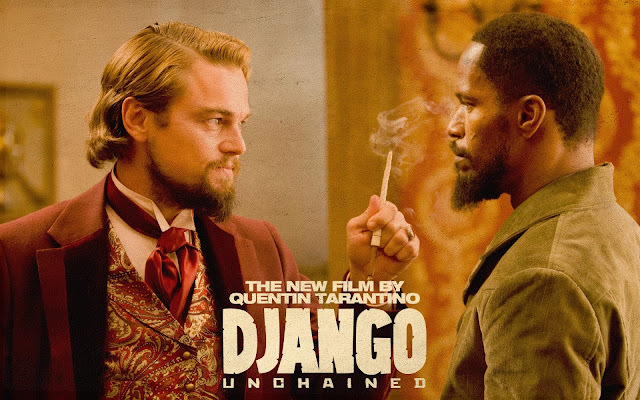 I also laughed a lot, and I can say that love it or hate it, Django Unchained will surely touch you. I have read so many reviews that dwelt on the over use of the N-word. Personally, it did not bother me. At a certain point, I got to wondering what the fuss was about. This word seems to have too much power over everyone if you ask me. Yes, I know I am not African American, but believe me that I know my history of being black in America. I still recall reading then watching Roots, among other historical movies and books of the slave era, and over the past 7 years I have lived in two countries where racism is still alive and well. I believe that you're only insulted when you allow it, and for me, the N-word was a word for those times and nothing more. So when it was so much in Django, it only added validity to the time period the movie was set, because really, that was how people used it back then. I was also very much engrossed by the plot and action going on before me. That said, if you are offended by the word, and have not seen the movie yet, that is something to bear in mind. I won't spend too much time on this review - suffice to say that this was one of those situations where reality fell short of expectation. The first half of the movie, I quite enjoyed. Dr. Schulz (played by Christopher Waltz) is a slavery hating bounty hunter who takes a slave, Django (Jamie Foxx) under his wing. Together, they track down criminals with a price on their head, and hatch a plan to look for Django's wife. I enjoyed the portrayal of Dr. Schulz's character - showing a sly wit and genuine compassion.